There is a nice write-up in the January 2019 Hemmings Muscle Machines issue. Very cool! SAAC NW President Gary Bartman's 66 Mustang race car is in the leading photo! Thanks, Brian. Would love to have that photo from Hemmings. Will dig for it. can someone post the pix from that article please? i was told there was a pic of my car. You can download the magazine from this link. Here is a picture of your car cut out of one of the pages. very cool. great event, look forward to returning with judges suggestions completed. There is a correction to the photo of Bob McClurg in the garage with some of the Hawaii members. 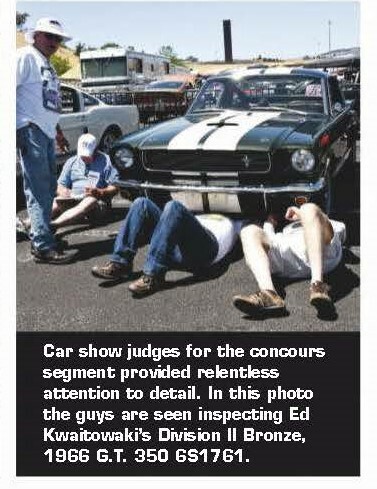 Bob is standing on the left in the photo with Aloha Mustang & Shelby Club past president Michael Calabrese and wife Kathy who live in southern Arizona. Carol and I are on the drivers side of the Kei and Miki Iinuma's Cobra. The AMSCH group had sixteen members and five cars attend. They need to do their homework on the 68 Trans Am series too. Ford got skunked due to their choice of a small block tunnel port. Ford barely beat AMC for second place. Also Can-am didn't start until 1966.